Census data shows that some counties in Kansas are growing faster than others. 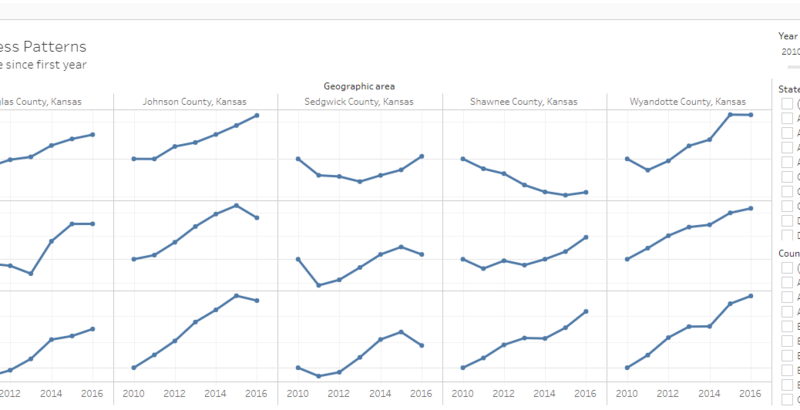 What does this data tell us about counties in Kansas? I gathered the data back to 2005 and made the data in an interactive visualization available here. In the nearby illustration I show the data for large Kansas counties, starting in 2010. (In the visualization you may adjust all these parameters.) The data is indexed so that we can see relative changes independent of the size of the county. In the chart, we can see that some Kansas counties are doing better than others. Notably, Sedgwick County shows a decline in employees and payroll in 2016. Example from the visualization showing Kansas counties. Click for larger.